Art can come in many forms – from the serious to the goofy, and today’s sketches are of a piece of commercial art that definitely falls into the latter category. 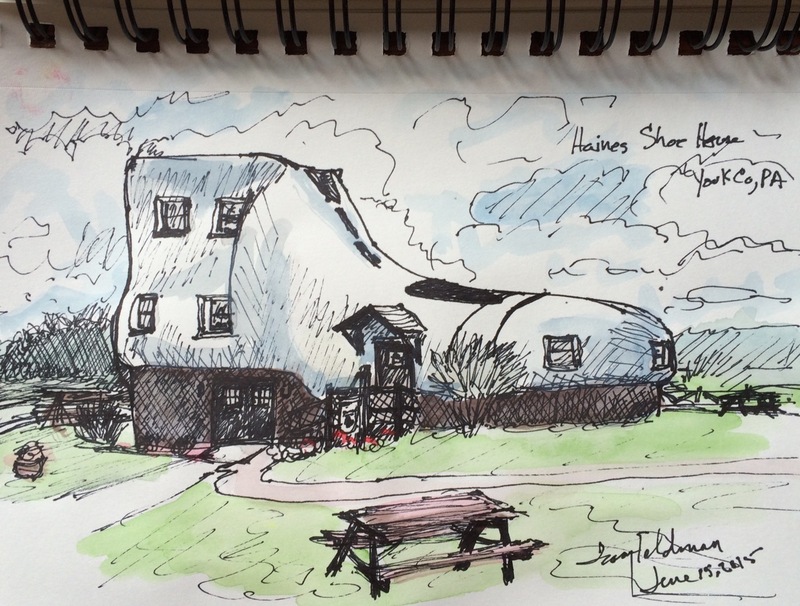 It is the Haines Shoe House. As with similar American commercial art, the Shoe was designed and constructed specifically to attract attention and promote a product or location. Not all these building look like shoes, of course. Over the years I’ve seen giant snow cones, coffee pots, frying pans, tires, fish, and even the Longaberger office building, built as a 6-story picnic basket. We have driven past the Shoe for over 30 years. It reminds me of the children’s nursery rhyme that starts out, “There was an old lady who lived in a shoe”. We’ve always wondered about its history, but never took the time to find out. Yesterday became the day because Arny had read an article on a new owner buying, refurbishing and re-opening the Shoe to the public, and we wanted something small to do on a hot, hazy, humid day. I’m glad we visited the Shoe. attention to his chain of shoe stores. Some initially thought that was a crazy risk. But by running a contest all over the area his stores covered, he proved the doubters wrong. The contest's prize was a free week’s vacation in the Shoe -- with paid servants, a chauffeured car, free tickets to shows, free shoes, and clothes, etc. for the winners. 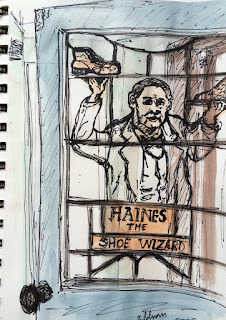 According to our guide, Haines brilliantly increased the newsworthiness of the contest (and the shoe/shoe store chain) by partnering with the mayors of all the towns, who submitted the names of their town's newlyweds and golden anniversary couples. Thus the mayors sent out press releases when one of their couples won the contest. In the first year of the contest, the stores' revenue increased by about two and half times what the scheme cost Haines. 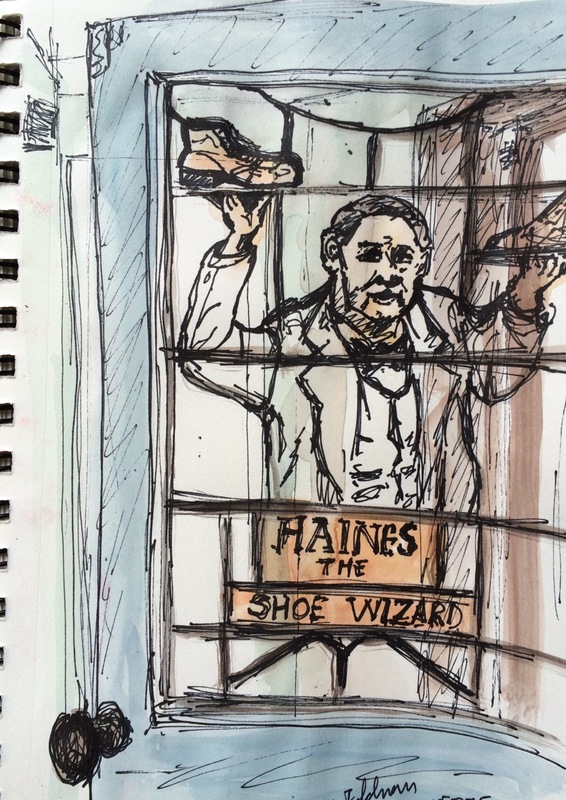 When Haines died, he passed the Shoe on to his employees, and its fortunes went up and down over the years. The current owners run a bakery/ice cream shop. (We got sugar cookies for Arny that he really liked.) They also conduct paid tours of the Shoe. The tour isn’t inexpensive for the size of the attraction, but the personal attention is excellent and the atmosphere is very friendly. We hope these owners have success because it's neat to see a piece of Americana being preserved. 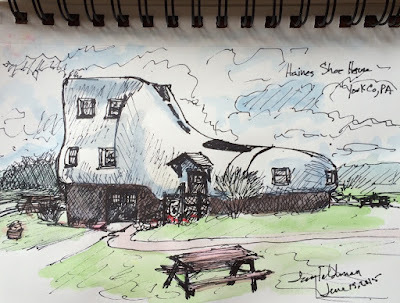 I hope you enjoy my sketches as much as I enjoyed our tour and visit.